WinView raised a partial close of a $3.4 million Series A round of equity financing to allow the company to further corner the synchronized two-screen TV market as well as continue to push their live television play along, digital fan experience. The Silicon Valley-based sports technology business is focused on delivering free mobile two-screen synchronized televised sports games for prizes in the U.S. WinView Games (WVG), CEO and Founder, Dave Lockton, chatted with THE Sports Techie community blog about their most recent investment led by cable TV and next-gen business guru Tom Rogers, and media, entertainment and sports veteran Hank Ratner. A total of $6.5 million has now been invested in WinView. The new influx of funding gives them the capital resources and board expertise to grow the app that connects the worlds of live TV sports, mobile apps, gaming, and interactive advertising in order for casual sports fans and dedicated second-screen fantasy players to engage with sports on TV in a new fashion by having more fun, enjoyment and further interaction with their favorite teams, and ideally with each other. The unique app specializes in providing a social experience while competing with buddies on second screens in order to earn sweepstakes based rewards rather than money making this form of gaming legal in all 50 states. The App Store application is scheduled to launch before the upcoming football season. WinView Closes $3.4 Million Series A Funding Led by Media and Sports Industry Executives Tom Rogers and Hank Ratner for Its Play Along With Live TV Sports Games. By using free sponsored dollars, users will win prediction contests and prizes with redeemable points. This cash and advertising exchange with sponsor’s names allows for sponsored videos and contests while driving revenue. All of the games WinView covers are produced in a live studio environment by game producers based on what is happening in real time on the playing field at say, Levi’s Stadium. TV viewers can demonstrate their knowledge of sports and enjoy the experience of forming teams and leagues to compete, enabling friends to play each other, and even parents to play against their kids, so get ready Kellan. Because the WinView app taps into what has become commonplace TV viewing second screen behavior of engaging with a mobile device while watching the big screen, viewers are more likely to remain engaged in the TV broadcast throughout the entire live game. Many viewers are competitive with each other. I challenge my brother to make offense and defensive coordinator football calls all the time during live games and vice-versa. Combining the need to compete with a game of skill that is highly social, Lockton feels, is exactly what daily fantasy is not. Daily fantasy sports are not social; it is seasonal and has relatively zero built-in communication tools once the game starts. WVG has chat engaged throughout the game making it more social than DFS. The Founder is an inventor, entrepreneur, and both wireless and push tech pioneer. This is his third startup venture. As the CEO, he is responsible for running and playing over 5 million games over 12 years. By modifying the technology over time, with a relatively small group of people, Lockton is confident about the newest direction WinView is headed. The synching of two screens with wireless network was pioneered by Lockton back in the 1990s. A second TV version was created in 1995 for football enabling TV events and sports broadcasts to sync with cellular and web. Their portfolio of 26 foundational patents is based on a game of skill and chance together with programming. Lockton said he studied how Xerox and Kodak staked out protection for patents and followed suit on WinView’s patents covering the synchronization of the second-screen with TV broadcasts and commercials and the optimum methods of monetizing sports-based games of skill, among other types of programming content. The patents also describe their user interface and menus for two screen service across platforms. Lockton insisted they are not patent trolls; rather they are pioneers and investors with the sharing of revenue. By using free sponsored dollars, users will win prediction contests and prizes with redeemable points. This cash and advertising exchange with sponsor’s names allows for sponsored videos and content while driving revenue. The WinView platform and its foundational patents permit it to provide sponsors and advertisers with exclusive access to all the two-screen game participants through sponsorship of the game, in-game videos and incentivized interactive commercials in sports telecasts both pre-game and during live sports gaming. Investment proceeds are marked to complete development and launch the WinView Games app coinciding with the 2016 professional football season. 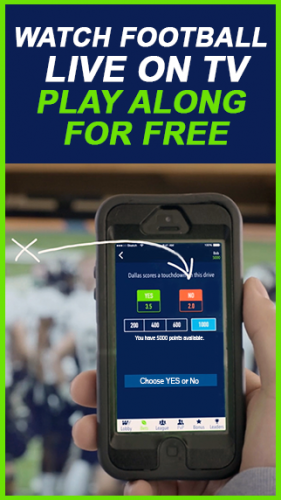 WinView allows users to play along with NFL games in real time with live televised sports in order to compete and win prizes based on an advertising supported sportsbiz model. The Company plans to expand its service in partnership with the TV and cellular industries, leveraging its intellectual property to establish a two-screen synchronization standard across the entire TV broadcast and cellular networks, which are industries that rely upon standards to function efficiently at scale. 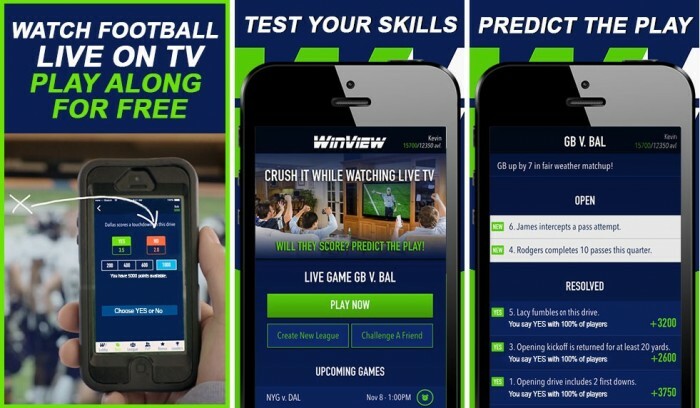 During the 2015 -2016 football season, WinView successfully beta tested its app, which validated the Company’s business strategy, market potential and patented technology reliability. WinView’s U.S. target audience for its advertiser-supported app includes 57 million sports fantasy league players and 200 million TV sports viewing fan base. WinView’s mobile game sports app is designed by European firm Ex Machina Group (www.exmachinagroup.tv) and is based on their fully developed PlayToTV platform, which has been used by multiple hit reality and entertainment TV programs around the world with millions of simultaneous users. Lockton said, “People are flocking to secure a job because they get to watch football, have fun and make money” Of the thousands that apply, only 4-5 are selected after evaluations are conducted and training is over. “These champions are marvels,” added Lockton. They use two producers a game for the 1 pm and 4 pm ET NFL Sunday start times. At most there would be 7 games playing simultaneously mainly during the earlier slot. Therefore, he says they would need around 18-20 producers on a Sunday manning studio cubicles. If there were 25 games running, it would mean there are 25 WinView experts watching along as users predict whether the SF 49ers will score on this drive against the Seattle Seahawks nasty defense while in pouring rain at Century Link Field as the boisterous 12s holler on. Each producer is paid by the hour as a fixed cost of say $200 so it does not matter how many games each producer manages, they love being a part of the WVG team as hourly employees. When they finally ramp up personnel, WinView wants to employ 200 full-time workers with about 150 game producers. The start-up environment in the Bay Area currently has 22 employees with a seven person overseas team in Amsterdam that code. They are using 20 part-time producers to monitor a live game which needs to grow to 75-100 in a short amount of time. The Silicon Valley-based sports technology business is focused on delivering free mobile two-screen synchronized televised sports games for prizes in the U.S.
Rogers occupies the Chairman of the Board at Tivo, Inc. after an 11 year stint as CEO. Ratner is is Vice Chairman of Cablevision Systems Corp. and former CEO of The Madison Square Garden Company. Both have been appointed to as Co-Chairmen of the WinView Board of Directors. By adding these media and next-gen moguls to the Board, WinView hopes to leverage their experiences and connection to make rain happen for the sports tech company. The Company also announced that the WinView board will be expanded to include investors Steve Goodroe, former Vice President Global Customer Marketing of Procter & Gamble and CEO of Dunnhumby USA, and Bryan Jacoboski, Managing Partner of Abingdon Capital Management. In addition, John Costello, President Global Marketing and Innovation of Dunkin Brands, Inc. and Global Chairman of the Mobile Marketing Association, is joining the Advisory Board. Interactive sporting events are surging in popularity with players, fans and advertisers alike. Lockton says the idea of a free and highly sociable app that delivers the feeling of being in your fantasy games is novel and what Millennials and Gen Z gaming players are used to. Adding in functional layers to the app such as the ability to provide and accept invitations, skill level segregation, and chat, enables WinView to continually update the iGaming experience with new features. It is legal to place a bet of a sports game or event in Europe. Euro fans have shown a willingness of playing on a phone and interact all while attempting to win cash, prizes and bragging rights. Lockton discussed how the iGaming business valuation is up to $165 billion. In-play wagering hovers around $160 million at the moment, said Lockton, yet 70 percent of all bets are done with live sports. The proposition of winning cash, while experiencing interacting gaming with friends, coworkers and even strangers, is exactly what WinView plans to provide to loyal users, and interested partners or sponsors. 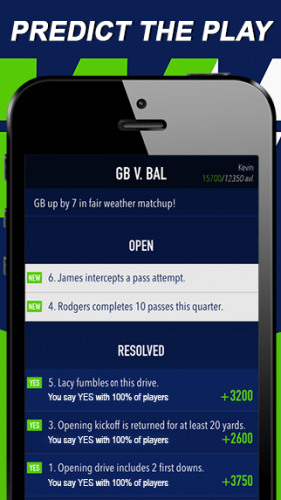 The WVG App Store application is scheduled to launch before the upcoming football season. Will interactive gaming such as WinView take over the screens and push fantasy sports to the side here in America? Is this the future of e-Sports? The industry of course goes beyond US and European borders. For now, Lockton feels that focusing on North America is first, followed by bringing on soccer so Euro football fans can watch and engage with the WinView telecast. The in-Stadium experience has led to a recent discussion with a major football franchise about a sponsored version, complete with in-game players. This arrangement will require a robust Wi-Fi connection said Lockton. WinView will have to build out separate games for fans attending games because they would have an advantage before a TV signal arises inside of venues. Sponsors that might be interested include Comcast, Version and AT&T. I queered him as to whether MMA and the UFC were on their future radar. Lockton said after conducting market research and compiling their app store beta test data, baseball and basketball were most likely the next sports to be developed after soccer, however, MMA is right behind them in terms of what fans wish for. I asked him about the future of eSports and found out they are in talks with a major eSports production company about a new partnership. Sports Techie, The concept of constructing an app that allows fans to win prizes as they answer in-game questions while competing with friends in real-time during live televised sports sounds easy enough but up to now, it has not captured mainstream usage. It seems as if the perfect business development storm is brewing for WinView in that their timing is well thought out in terms of the state of the gaming industry, their patented technology has fully matured, it is protected and has been beta tested with the new American pastime, football, in order to show high user adoption rates, mass scalability and the ability to monetize the proprietary solution. The concept is for family and friends to play together. Play against your wife, boss or favorite sports bar bartender from anywhere you and the live data feeds are streaming. A father and his three sons could use their DirectTV Prime Ticket subscription and play different telecasts at the same time from different televisions around the house. Look for cross platform adaptability in the next one or two years on Twitch, ESL or Turner where players can use the same phone or ipad for streaming content and play along while predicting eSports contests when the data pops up and then disappears. Will WinView patents prevent FanDual and DraftKings from entering into this major market? 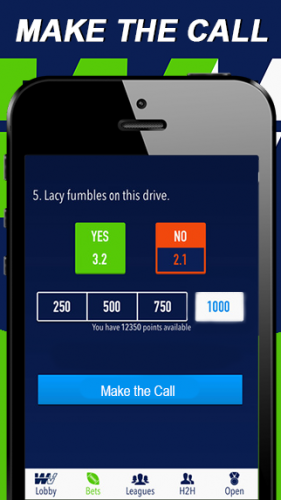 Keep an eye on daily fantasy sports this coming football season and see if they enter into live interactive gaming with a more social bent. How does this news compare to the NFL and Twitter deal in the scope of live sports engagement? It is too early to tell. One immediate difference is Twitter already has about 140 million daily users while WVG is just getting started. Look for WVG to fully operate alongside national NFL games such as TNF, SNF and MNF, in addition to nationally telecast college football games this fall. Of course, as a Seahawks fan, the play to end Super Bowl 49 is one that comes to mind when I would have bet the kitchen sink with anyone of you around the States or globe that the Hawks were going to run Beast Mode at the goal line on 2nd-and-goal from the New England Patriots one-yard line with 20 seconds left. Instead to the surprise of most fellow 12s and the world (maybe not Pats fans), quarterback Russell Wilson dropped back and tossed an interception to rookie free agent Malcolm Butler to end the game in dramatic fashion. I wonder what y’all would have predicted on that play? Probably a run eh. The Falcons begin playing in the new Mercedes-Benz stadium during 2017. Does that mean they win all eight homes game because Matty Ice, Julio Jones and Devanta Freeman each have a predictably explosive offensive year. I cant wait to play WinView during the 2019 Super Bowl hosted at MB Stadium after the Seahawks win it. The ecosystem that makes up sports networks, leagues and advertisers can soon turn to WVG for their live sports gaming needs.